3months Later, I am posting a new post! Whoever still reads me, this is for you! LOL! WOW! What a crazy three months it has been! Gabriel is now almost 9months old!! Hard to believe it was just one month later with Maddy that I found out I was pregnant with Gabe! I cannot imagine being pregnant with a third right now! Gabe is a speed crawler and pulling himself up to stand! He will be walking before I know it I'm sure! He has two teeth now and his top two are coming in as well! When did he grow up??? Thankfully he is a mama's boy and still loves to snuggle! Maddy is now pretty much potty trained!YEAH!! Although I say that and the other day we were visiting Ashley at work and she pooped her pants! Other than that, she is doing great! She wears a pull-up at nap and bedtime, but is doing so good! I am so proud of her! She moved up from her Elmo potty to the "big girl" potty with a cushion seat on it! The cushion has little ducks on it and she always says she needs to use her "duck"! We are so THRILLED beyond excitment for my sweet sister and her husband who are expecting their second baby in February! Such an amazing testimony of God's love! Loosing Brie was the hardest thing our family has ever been through. "Things like this just dont happen to us"-this is what my mom said again and again after Brie went to be with Jesus. The anticipation of a new baby has lifted everyones spirits in a way I cant explain! Sarah and PJ are filled with hope and excitement that their home will be filled with children's laughter! I think of them as parents without children b/c thats what they are! They are parents, but to a little girl who is in heaven! I am working at Pottery Barn Kids now, part-time and Sarah and I have already picked out her bedding! Cant wait to find out what she is having! On another note, my sister-in-law is expecting a boy, so Gabriel will have a boy cousin! They are thrilled and of course Joe's parents are too! All these babies do give me a little itch, but as Joe always says, " Dont scratch it!" LOL! We are so excited to be moving into our first house in a couple weeks! Yeah! Packing is underway and I CANNOT wait to be in a house! Pictures will come soon, once I get things settled, which may be forever! Kids Market is coming up too!! Like I said, lots going on! It's kinda nice to be doing it while I'm packing b/c it makes me feel super organized! It is so much work, but I definetly enjoy the rewards! Well, I guess thats it! Time is flying and I cant believe we are so close to Fall!! Starbucks pumpkin spice latte comes out Sept 1st, and you know I will be first in line! Btw, I forgot to mention there is a starbucks right outside our new subdivision! Holer!!! A New Post-At Least for Now! Well, my second attempt at keeping up with a blog has been an embarrasement! I so enjoy reading other people's, and then seem to always run out of time to keep mine up to date! So, please don't delete me...I'm still here! A lot has been going on with us lately! We got back from SC visiting the fam last week, and of course we had a wonderful time as always! I must've been super emotional b/c I cried in the car on the way home! I miss my family so so much, and as time goes on I realize how much I really wish we were together more! It was especially hard to leave this time b/c it was the first time that I got to see Baby Brie's grave marker. We were there for the funeral in February, but her ashes hadn't arrived in time, and when they did get there, P.J. and Sarah wanted to be alone with her-which was totally understandable! She is buried on a hill in the cemetary with beautiful douglas fur trees all around her! It was so hard to see her there, and all I wanted to do was lay down in the grass, put my hand on her marker and just stay with her. What an incredible, incredable loss it is to loose a baby. All other hardships just seem to wave in comparison. I never got to hold her since I was still in Alabama and in the hospital with Gabe, so to be by her gravesite, was in the way, the first time I saw her! Sarah is doing better each day, and is really hoping and praying for another pregnancy soon. It amazes me how people seem to think that she should just "get over it". Loosing a child is something you never get over, and no one should in any way try to rush the grieving process. Everyone deals differently and in their time. I admit that it has been especially difficult for me with a baby the exact same age that Brie would have been. I just can't imagine not having him, and so my sadness for Sarah feels so real everyday I am with him! What a wonderful promise we have in Jesus that although we walk this world with pain and sorrow, beautiful Brie never knew anything but the comfort of her mother's womb, and then the comfort of her Father's hands! On a lighter note, Miss Madeline turned 2 while we were in SC, so we celebrated "Dora, the Explorar" style. I didn't want to do a huge bday bash with the wound of Brie's passing still so fresh for Sarah, so we just had a small party! She had such a wonderful time, and that was really all that mattered! We are now tackling potty training! So far so good. Maddy knows that she needs to sit on the potty and go pee-pee. She's talk to me about it, but will still just sit there and sing and talk with no action in the potty! I have decided to put her in big girl underwear and basically just take her every 30min or so until she can go! This was my Dr's suggestion. She still wears diapers at night though. If anyone has any suggestions, please let me know! Joe is looking into a new career path as the "Area Director" of Apartment Life, inc! He has been so so ready for some sort of work in ministry and I am so excited for him! Being a sales rep for Cooks has been good, but the hours are horrendous! He leaves around 7am and we are lucky if he's home around 6pm.Needless to say with a 2year old and a 5month old, being hime for 11-12 hours with them by myself can make anyone go a little loopy! Gabe is doing so well, and just the perfect baby if I may be so bold! He is so easy and so happy all the time! 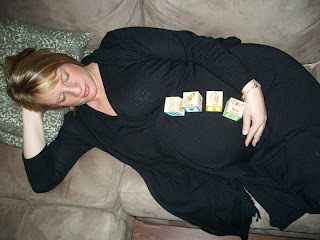 If Maddy was this easy as a baby we may have had Irish twins! I am seriously spoiled with him! We have started solid foods!! His favs are pears and bananas. I did sweet potatoes last night, and they weren't a huge hit, but hopefully he will warm up to them since they are so super easy to make! Over the weekend Joe's sister, Naomi, got engaged too!! Yeah! The wedding is in November and Maddy is going to be the flower girl along with her other cousin, Briana! I know they will be so sweet! Thats about it! Hopefully my next post wont be so long and few between! Wow! Life is crazy...but so wonderful! Having two under two at home is a lot crazier than I expected! I love it and find myself just smiling or getting excited for no reason other than to be home with them. I just started a part-time job, and honestly the hardest part is leaving my babies! Gabriel is sleeping on average, a solid four hours at night, and then is up about every two hours after that. Madeline is in her "big girl" bed now, and has been getting up around 6:30 every morning, so that has made life very tiring! I know once Gabe really sleeps through the night, things will be a lot better in the tiredness department. It's definetly an adjustment to go from one at home,to two! Especially two under two! My sister and brother are 17 months apart, and my mom and dad waited 4 years before they had me! I think they had the right idea! Our life is our kids now, and basically my day is just taking care of them and attempting to do laundry or clean up a little. Before I know it, its dinner time and Joe is home! I feel like I'm on more of a schedule now, but at this point cannot even imagine adding another into the mix! We go through about 30 plus diapers a week. I am still working on potty training with Maddy, but since Gabe has been born, she has been less than interested! I'm still breastfeeding and plan on it as long as I can! I nursed Maddy until she was 10 months, and want to at least do the same with Gabe. I have been very blessed in that department. Both were and are excellent nursers, and my milk supply has always been in plethera! The only down size is having HUGE you know whats!! Maddy has really taken to Gabe now, and the big thing is making sure she is isn't squishing him with her hugs and kisses. I can't wait until they get a little older and start playing together! 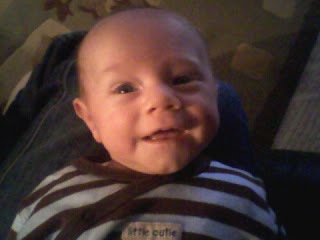 Gabe loves to smile and is one of the happiest babies I've ever seen-except when he's hungry! He eats every two hours! Very exhausting, but I'm used to it now! Maddy is really starting to talk in sentences now, which I love! She will be two in two months and I can't believe it! Gabe is already 10 weeks! WOW! No new post from me in 7 weeks???!!! Life is definetly a lot crazier and I rarely have any time to post anything anymore, but I somewhat have Gabriel on a sleeping schedule now, so that helps a little! What a past few months it has been! We welcomed our beautiful baby boy into the world on Nov. 30th-2 weeks early! Our crib came that day, so I was very happy it came in time! He is such an overwhelming blessing to us and we love him so much! 3 days after he was born, we had a huge loss in our family when my sister lost her precious baby, Brie Hackett. She went in to the hospital b/c she was in labor, and there was no heartbeat. Brie's cord knotted up leaving her slowly loosing oxygen for a few weeks, resulting in her heart suddenly stopping. We of course were devasted! It has been an extremely hard time for Sarah and her husband, PJ as they mourn the loss of their child so late in pregnancy. Sarah later told me that she felt God told her that Brie and Gabriel were friends in heaven and Brie wanted to make sure he was born and ok, before she died. It killed me when she said that, but I know that Brie will never know any pains of this world and is at total peace in heaven with Jesus. We all cannot wait to be reunited with her in heaven! Here's Brie resting in her mother's womb. That is how I will always remember her...resting in peace! B/c of this horrible situation, Christmas was a little bittersweet this year but still a lot of fun. Maddy was so much fun opening her presents. I love that she is older now and gets so excited about everything!!! She got so much and was definetly spoiled from grandparents!! Christmas definetly becomes about the kids when you get older! She learned to say "Jesus" this year and "Kissmas" which was so sweet to hear!!! Our new years was also a blast, except on January 1st, we rushed Gabe to the hospital for a high fever. He was diagnosed with a severe respiratory infection that spread up his spinal cord and into his brain resutling in viral menenjitis. He spent 3 days in the special care unit at Children's hospital. It was a very scary and sad time, and we didn't know if he was going to be ok or not! God gave us such comfort and healed him and he just improved and improved. We were so thankful his menenjitis was not bacterial which can cause brain damage and even death. He will be just fine and has no long-term effects at all! He is our little fighter and I know God has huge plans for his life that Satan cannot stand! We are all finally back to normal around here and have huge anticipations for the new year. We are hoping to get a house this fall, are keeping strong faith that Sarah and PJ will experience the miracle of another pregnancy this year, are adjusting, with joy, to a family of four, are in prayer for healing for Joe's sis, Naomi from Crones Disease.,and are praying for another baby for my dear friend who miscarried her baby over Christmas. We cannot wait to see what is in store for 2011! Christmas time is officially here!!! Yeah!!! I was watching "Oprah's Favorite Things" show the other day, and it got me so excited about Christmas! Although, my favorite things don't all cost a million dollars like hers! Here are my favorite things about Christmas! *My mom's homemade apple cider! *Seeing Madeline get so excited about everything and say "Oh wow" everytime she sees the tree! *Drinking egg-nogg latte's from Starbucks! *Comfy sweaters and coats and cold weather! *Being with family and close friends! The list could go on and on, but I love basically everything about Chrismas!! If it Wasn't This, It Would be Something Else! Ever seen that movie, "Elizabethtown"? It's one of my faves, about a son who comes to grips with his father's death. Although there is a very annoying Kirsten Dunst in it who attempts to have a Louisianian accent, I still love the movie! One of the dad's favorite sayings while he was alive was,"If it wasn't this, it would be something else." Sometimes life definetly feels like that! Maddy burned her hand on my straightener about a week and a half ago! A HUGE blister formed, which of course popped before it's time, with a toddler who couldn't stop messing with it. I didn't really realize how bad it was until the blister popped. I took her to her pediatrician last Wed, to check it out b/c it wasn't getting better. He said she needed to go to the burn unit at Children's Hospital b/c it looked really bad to him. So, we went, come to find out it was a second degree burn which caused some inmobility (sp?) with her thumb caused by scar tissue. The Dr. said with some massage exercises, complete mobility should return! Yeah..she was going to be ok! We have to change her bandages once a day, which she does not like!!! Thurs, she started getting sick and I noticed a lot of mucus in her eyes. Come to find out she somehow picked up pink-eye at the hospital, along with a bad cold! Aren't hospitals supposed to be where you go to get better?? So, now we are on eye-drops three times a day( which she also hates), plus she can't really go anywhere or be around people for 3-5 days. I am starting to get a little cabin fever..big time!! She's also on cold and fever meds, so hopefully that will clear up soon as well! I really feel so bad for her...she really is so pathetic when she is sick! I have to admit, I am loving the cuddler she becomes when she's sick, but of course I HATE to see her like this! So, between prescriptions, hospital visits and Dr's visits this week, I am super bummed that there is no extra money to finish up Gabriel's room! That was the goal this week! Oh well...I just have to be patient until next pay period I guess!!! It will probably be finished the week he is due, which I am fine with...as long as it's ready before he comes!!! It is NOT easy to take care of such a sick little girl at 8 and a half months pregnant!! Thankfully, I have been doing well...just tired and continued back pain! So, it definelty feels like, "If it wasn't this, it would be something else" around here for sure!!! Last night we took part in our second year of "Trunk or Treat" with our church! It was a lot of fun and Maddy was so cute going to each car and collecting her candy! She LOVED the jungle gymn and kept running to go play in it! I think she went in and out about 4 times. We really had so much fun! There was a chili cook-off and free hot dogs and drinks and a hilarious "Kid's Clubhouse" after all the trunking and treating was over! Here's our FSU girl checking out her candy!! And here's Maddy our first year going-she was a puppy-all 6 months of her! In baby news..I am 34 weeks now! Flying! Although, at this point it's starting to drag on a little bit! My back is shot at this point...I think b/c he is so low, but hopefully that will make for a quick delivery!! Nothing really new to report..just really getting ready for this little man to be here! Joe and Beth met their freshman year at college and started dating a year later! They soon fell in love and were married on June 16th, 2007. They welcomed a beautiful baby girl, Madeline, in April 2009 and an amazing baby boy, Gabriel, born Nov. 30th 2010.